Since olden times, people like to compare their strengh. 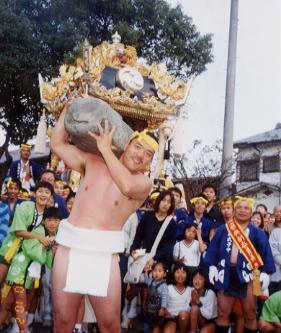 In Japan, at many temples and shrines there are heavy stones and the menfolk try to lift them as a special event during the annual autumn festival. A priest famous for his physical strength, Benkei, has stones named in his honor, Benkei Ishi　弁慶の力石. In Japan, it was also cutsom since old times to lift a stone after making a wish and judge from the feeling of the weight weather the wish was granted or not. These are the famous "Heavy-light Stones", which I have described in detail here. Heavy-light Stones / Omokaru Ishi おもかる石. 重軽石. This was a form of "Stone Oracle" ishi-ura 石占（いしうら). 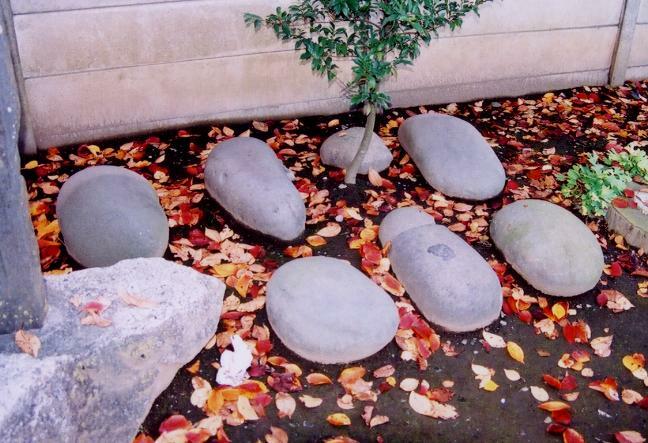 At the Yokkaichi University, there is a group devoted to the study of these stones. They have a huge haiku collection, which I will introduce below. The strong men of the village who could lift the heaviest stone for the longest time were of couse venerated by all and called Strong Men, chikaramochi 力持ち. The oldest stones with inscriptions are found at the Hachiman Shrine at Kuki Town, Saitama Pref. The information is taken from the site of Yokkaichi University.
. . . CLICK here for Photos from Shrines !
. . . CLICK here for Photos from Temples ! Lifting stones are common throughout northern Europe, particularly Scotland, Iceland (where it is referred to as steintökin), Scandinavia and Northern England. They were usually heavy local stones, without any modification, with the challenge being to lift such a stone, proving your strength. Some of the stones are in fact so heavy that there has been no authenticated lift in modern times, only legend. Recently, lifting stones have often been incorporated into the World's Strongest Man competitions. Clach cuid fir, Gaelic for "Manhood Stones", originate from Scotland and Clach-ultaich. In Iceland, lifting stones were categorised into the fullsterkur ("full strength") weighing 155 kg (341 pounds), the hálfsterkur ("half strength") at 104 kg (228.8 pounds), hálfdrættingur ("weakling") at 49 kg (107.8 pounds) and amlóði ("Useless") at 23 kg (50.6 pounds). Stone lifting is also a traditional sport in the Basque Country involving the lifting of stone, called harri jasoketa. is a traditional Scottish and Icelandic athletic event involving the carrying of large stones down the field of competition. The weigh-lifting game by using stone is played in the mountain areas in Switzerland and Spain. Also in Japan, it has been played among the people since the Edo era (1603-1867), and it was called "chikara-ishi". Such chikara-ishi now found here and there at shrines and temples in the northern part of Awaji Isl., in Hyogo Prefecture. Those who did this stone-lifting were the young serf named otoko-shu. In summer, in the evenings, when their work was over, they gathered in a meeting place or a shrine or the ground of a temple in twos and threes and they competed for strength by lifting or practiced carrying stones. But as the change of social structure brought about a decline in the number of people of the "otoko-shu-class", labor became mechanized and the way of recreation was changed, and stone ifting has ceased to be played and only the reminiscence of the past are shown in monuments. is dedicated to Sugawara-no Michizane and he is said to be a descendant of Nomi-no Sukune, who is said to be the first rikishi (sumo wrestler) in Japanese history. There was a monument dedicated to Nomi-no Sukune inDazaifu Temmangu shrine. In front of this monument, there are three large egg-shaped stones sitting on the ground. These are so-called"Chikara Ishi" or power stones. Men who are extremely proud of their own power used these stones to compete each other. There are also stones within the grounds called “Sashi-Ishi (Chikara-Ishi).” It is said that during the Edo Period, people played sumo and young people used to compete to see who was the strongest by shouldering these stones. Today, a children’s sumo event is held in May. Yokkaichi University Study Group on Lifting Stones.